Should You Give Up On Social Media Marketing? The claim that social media will drive more customers to your business than search, email or other traditional and online marketing channels has once again been exposed as a myth. Or has it? A recent study by Custora found that email marketing and search deliver more profitable customers than social media. I wrote an opinion for Entrepreneur Magazine about the Custora study: Does Search Produce Better Customers Than Social Media? A short opinion piece doesn’t leave you with actionable insight, however. I’ve been thinking more about the Custora study, and want to share some further thoughts on how you might consider changing your marketing strategy based on the Custora study. If you didn’t read my Entrepreneur article, here’s what Custora found: the lifetime value of customers acquired through Twitter was 23 percent below average, while Facebook ranked as average. Facebook and Twitter’s combined customer acquisitions (see below graph from Custora’s study) represented less than one percent in 2013 and for each of the prior four years. Custora analyzed 72 million customers shopping at 86 retailer websites across 14 industries. Custora measured what and how much a customer bought the first time they purchased a product or service, and then again measured purchases by the same customers two years later. 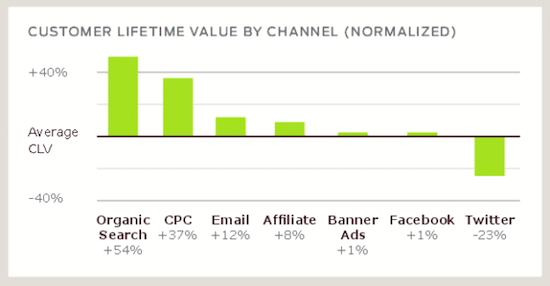 As you can see from the following graph, organic search customers spent more money and shopped more frequently than customers who originated from other channels. How should you change your marketing strategy based on the findings in the Custora study? Should you continue to invest your resources in social media or should you give up on social media marketing? 1. Custora’s findings about social media are misleading. Social media isn’t designed as a direct advertising channel, so it’s not surprising that Custora failed to find a strong correlation between social media and sales. Our own marketing experiments at crowdSPRING mirror Custora’s findings. We experimented with direct advertising on Facebook and Twitter over the past four years. For us, and for many other companies, direct advertising on those networks was ineffective. Social media has been an albatross for most companies because consumers have become accustomed to receiving discounts and deals on social networks. Discounts adversely impact the value of those customers and rarely create loyal customers. But, the fact that direct advertising on social networks isn’t effective does not mean that you should ignore social media marketing. Custora’s findings about social media are misleading because Custora measured the customer’s last-touch before a purchase. Social is rarely the last touch. A customer will often hear about a brand on a social network and then search for that brand on Google or Bing. It’s not surprising, based on last-touch attribution, that search would nearly always be credited (misleadingly) for finding that customer. In fact, Google, Bing and other search engines are increasingly considering and weighting relevance, authenticity and trust when delivering search results. Social posts and comments provide an important measure of those factors. When people read compelling content, they are more likely to socially share that content. Such social sharing is an important sign of relevance, authenticity and trust, which increases the visibility of that content in search. I’m not suggesting that you ignore the Custora study. Marketing is about the stories you and others tell about your company and its products or services, not about the stuff you make. Smart companies can build awareness on social networks, and such awareness can help strengthen advertising campaigns running on other channels. In fact, studies show that 71 percent of consumers say their online social interactions with a company make it more likely they would purchase from that company. It’s not surprising, then, that small businesses are increasingly leveraging social media and spending more and more money on social media marketing. Apart from engaging in conversations on social, you can easily, effectively and very inexpensively leverage social by experimenting with retargeting on Facebook. Facebook retargeting is an inexpensive way to remind prospective customers about your company. We’ve had much success with that strategy using a company called Perfect Audience. 2. Rebalance your social media activities. If you’re already investing time and money in social media, you should consider rebalancing your activities to maximize returns. According to Custora, each Twitter lead produces only 75% of the value of a Facebook lead, and only half the value of an organic search lead. If you’re investing all of your effort in Twitter, for example, and wondering why you’re not seeing a great return on that effort, consider diversifying and looking at other social networks. Customer acquisition through email has increased 400% over the last four years, according to Custora. This is impressive, but is also misleading. Email is rarely a lead source – if you have someone’s email, the consumer probably gave you that email after they found you via another channel, such as social or search. So, while you might have measured the acquisition through email, the actual lead might have come from another channel. Nonetheless, email marketing holds great promise. Other recent studies reinforce Custora’s findings about email. For example, marketing agency SocialTwist evaluated 119 social marketing campaigns over 18 months and discovered that 55.4 percent of consumers chose to share information or refer products or services using email over Facebook or Twitter. SocialTwists’ findings connecting email and social are interesting because they cast more doubt about the conclusions in the Custora study on the inefficacy of social media marketing. For example, most people grossly underestimate their audience reach on social networks. According to a recent Stanford University study, “Quantifying the Invisible Audience in Social Networks” , the actual reach (how many people see a specific post) on social networks is four times greater than people believe. Because social is rarely directly responsible for a purchase, it’s not surprising that other channels, like email, are found to be more valuable. If you consider the conclusions from the Stanford research and the SocialTwist findings, you can see that social media marketing can be effective, but we haven’t found reliable ways to measure and properly credit social media conversions. More importantly, social channels can be important when you develop other marketing strategies, including email marketing strategies, to support them. Companies that have little experience with email marketing have many resources to help them. For example, there’s great insight on the best times and days to send email to optimize opens and click-throughs, and even research showing that some companies would benefit from sending their email marketing campaigns at night. 4. Develop and improve your organic search efforts. Search engine optimization (SEO) can provide low cost opportunities for a startup and small businesses to improve organic search results. As Custora found, organic search delivers the most profitable customers for most businesses. Custora’s results about the importance of search reinforce the emerging focus on content marketing as a way to create more valuable inbound leads. Most people discuss content marketing in the context of sharing on social networks. But content has another valuable purpose – long-tail search results. Our social media and our search strategies became more focused and valuable when we invested our energy and resources in content. For example, the crowdSPRING blog is a popular startup and small business marketing blog (top 75 marketing blogs in the world, according to Advertising Age) and a great source of referrals for our business. We leverage the content we create for our blog on Twitter and Facebook. Our content facilitates conversations and helps us to engage and convert prospective customers. But we also get many inbound leads from search when our content is indexed by Google, Bing and other search engines. Few companies can effectively pursue a single channel strategy. Turn your company into a lean, mean marketing machine by building a more efficient marketing strategy leveraging multiple channels. 6. Your best customers are worth far more than your average customers. Nearly all studies comparing the efficacy of marketing campaigns in social, search, email and other channels focus on averages. That’s because every business is different and it’s easier to extrapolate based on averages. However, some of your customers are far more valuable than your average customers. In fact, your most valuable customers might come from channels that historically provide fewer customer leads for other businesses. What marketing channels have worked for your business? Do you agree with the results in the Custora study?